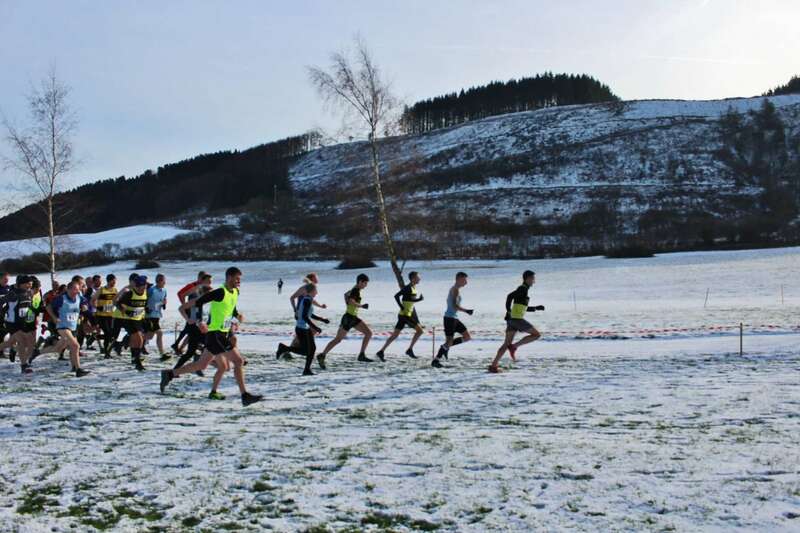 February’s first race was the 4th in the winter XC league, giving us a chance to enjoy the fabulous facilities at Fforest Fields, the best caravan/campsite in Wales. This race had been postponed from October, when a freak deluge had rendered car parking unusable. Again, the race was threatened by the weather, but this time the efforts of “Billy Wells” RC were not in vain. I liked the changed course, which left out the ascent through the forestry to the top of the hill & replaced it with a second lap. This made marshalling easier & also allowed several runners to decide they were overdressed & discard items of clothing at the end of the first lap. Despite the snow, it was no colder than any other typical winter day. However, the snow & ice created a challenge different from the usual mud, especially going downhill. Many runners were understandably cautious & I was very pleased I chose to wear spikes. Despite that, I heard of only a couple of falls & the St John’s Ambulance Brigade were mercifully idle. As usual, there was a good Croft turnout, albeit a tad light at the top of the men’s leaderboard. Mark L (5th in 42.44) was our first finisher, ably supported by Glyn (23rd 48.23) & Will (27th 49.45), with me making up the A team (51st 54.58). In my age-group I was nearly 9 minutes in front of my nearest rival & secured the MV65 league title. Captain Neil T (53rd 56.12) was just behind, closely followed by Ian Price (60th 58.09). Scott (66th 59.53) & Gary G (82nd 64.69) completed our B team. Guy (84th 65.55), Rob (86th 66.15) and Nick P (90th 71.04) were not far behind. It was especially heartening to see Tom D (95th 77.30) make a return to racing. The finale at Presteigne is on February 24th. A good showing by the men’s team could propel us into the bronze medal position. At the moment we are 18 points behind 3rd placed Wye Valley. Our women’s team will surely win a medal, but what colour? We are 17 points behind leaders Wye Valley, but only 9 ahead of Hay Hotfooters.